Коллега из Гонконга поделился новостью о лекции (семинаре) австралийского лингвиста Дэниела Кейна (Daniel Kane) на тему дешифровки киданьского языка и его генеалогической принадлежности «The Khitan Language: Decipherment and Affiliation (契丹語的解讀與歸屬)», которая пройдёт в Гонконгском институте образования 3 июня 2013 г. The Liao dynasty was established by the Khitans, a northern nomadic people, in 907/916. After defeated by the Jin in 1125, all knowledge of the Khitan language, script and other aspects of their culture was lost. Generally regarded as one of the archeological mysteries of Central Asia, the script has also been described as one of the few undeciphered scripts. This talk will discuss the process of decipherment, and recent developments. A certain amount of the lexicon is related to Mongol, but most of the deciphered words are not. A certain number of loan words (and calques) were borrowed into Jurchen, and thence into Manchu. Vowel harmony is clearly present, but has not yet been worked out in detail. There are clear signs of grammatical gender in the past tense of verbs, basic and ordinal numerals, some colours and several other adjectives. This is unknown in other Altaic languages. 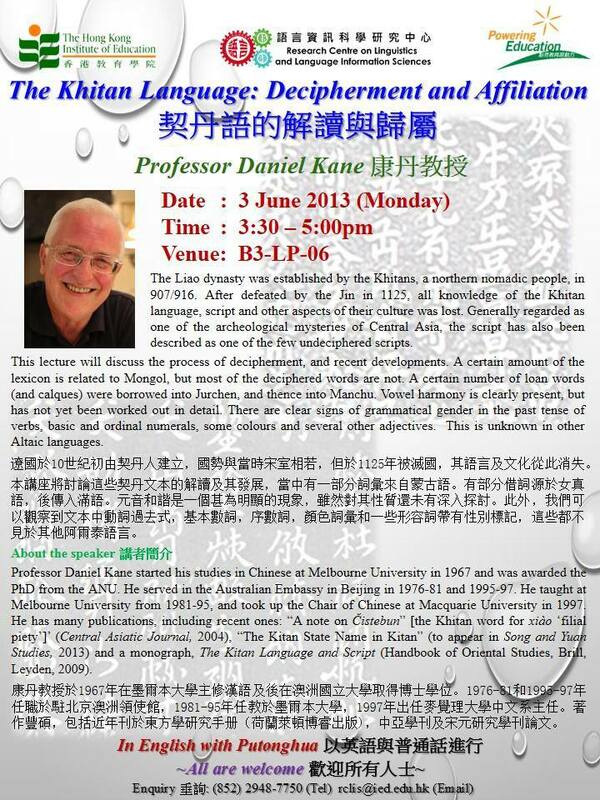 Professor Daniel Kane started his studies in Chinese at Melbourne University in 1967 and was awarded the PhD from the ANU. He served in the Australian Embassy in Beijing in 1976-81 and 1995-97. He taught at Melbourne University from 1981-95, and took up the Chair of Chinese at Macquarie University in 1997. He has many publications, including recent ones: “A note on Čistebun” [the Khitan word for xiào ‘filial piety’]’ (Central Asiatic Journal, 2004), “The Kitan State Name in Kitan” (to appear in Song and Yuan Studies, 2013) and a monograph, The Kitan Language and Script (Handbook of Oriental Studies, Brill, Leyden, 2009). This page was loaded Apr 20th 2019, 1:12 am GMT.